RECOMMENDED BY HYUNDAI FOR HYUNDAI VEHICLES. Title : Synthetic heavy duty premium quality Brake fluid. Ingredients : Polyalkylene Glycol and Glycol ethers along with anti-corrosion and anti-rust agents. Specifications : Meets and exceeds FMVSS 116 DOT 3, JIS-K-2233 and IS 8654. 1. Follow Vehicle Manufacturer’s recommendation for usage. 2. Maintain Brake Fluid level between max. & min. levels in reserve tank. 3. Do not mix different grades/specification of brake fluids. 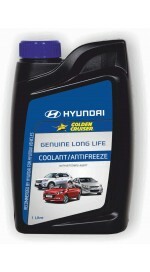 Golden Cruiser Hyundai genuine coolants / antifreeze is manufactured using the latest OAT inhibitor technology from Japan. This product is specially engineered for use in Hyundai high performance engines. 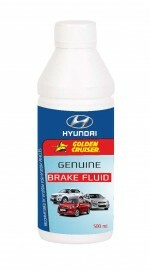 Golden Cruiser Hyundai genuine coolant / antifreeze provides excellent protection for aluminium, cast, iron, steel and copper/ brass engines and cooling systems. Check Cooling system capacity. Use as under : 30 % Coolant + 70 % water. CAUTION : Contains Ethylene Glycol. In case of accidental drinking, Contact a doctor immediately. Keep container tightly closed and away from children.